I might have mentioned previously that it can be quite difficult to make the most of the sights and activities of your home town, given you pass them regularly. Last weekend landed us. By that I mean we were stuck on land. Here are some activities on offer in Brisbane that we don’t attend nearly enough! Victoria Park Golf Complex, which is right next to the city, provides a wonderful 18 hole putt putt course. Now that is fun for everyone, young or old, couples or groups. You can enjoy the challenges of the course at three different levels of difficulty. And if it’s all just too hard, they let you drink on the course to ease the nerves. There used to be a frustration bag located halfway through the course. Now it is just a hanging chain… I wonder what happened. The evening can then be enjoyed listening to the smooth sounds of the acoustic band in the open air bar, munching on some delicious nibbles. All whilst taking in the city views. 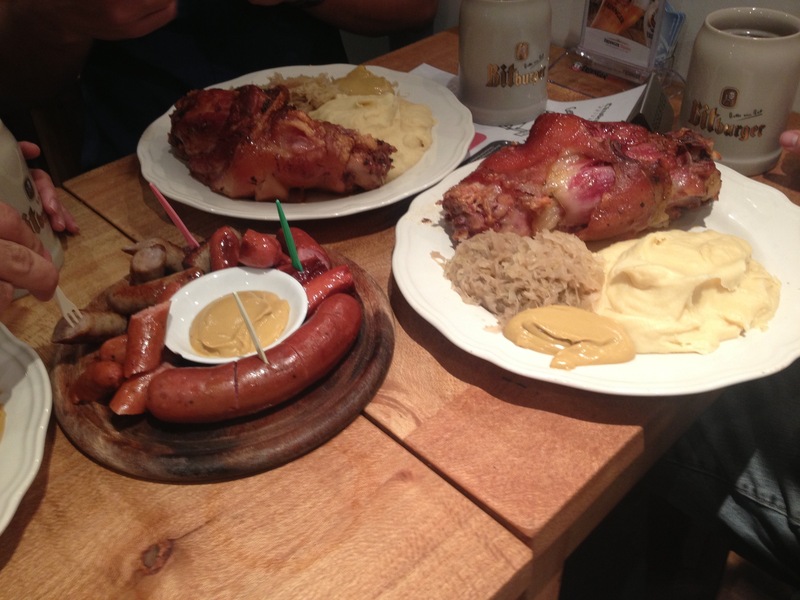 Entering the German Sausage Hut is like you have teleported from Australia into a quaint German village. Located in Burnett Lane, it is kept away from the hustle and bustle that overtakes Brisbane on a Friday night. The GSH is becoming much less of a well kept secret and more of a year round Oktoberfest. 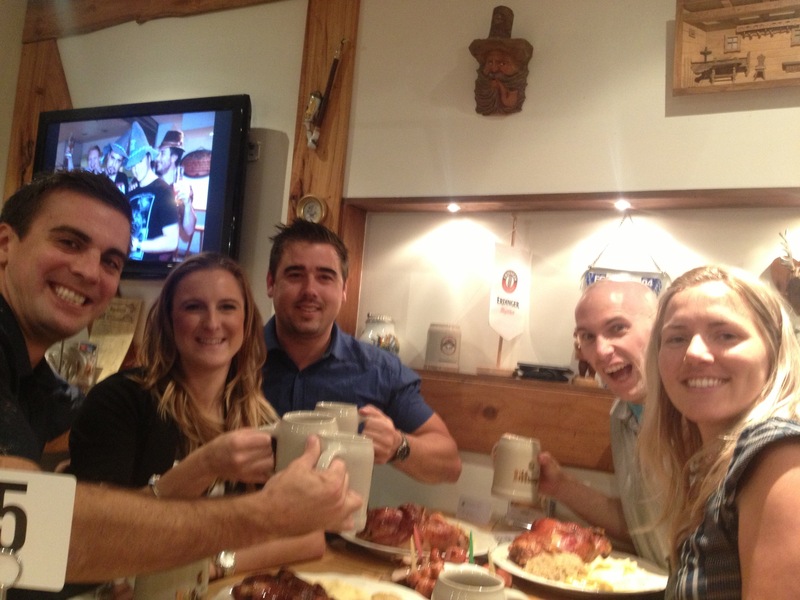 The boys are the reigning Brisbane Bavarian Strongman Oktoberfest champions (what a sentence). That meant we were treated as VIPs. The beers were flowing and the pork hocks were … Errrrrr … Hocking. If that’s what pork hocks do. Boy were they massive!! I tell you what, if sausages or pork hock are not your thing, those mashed potatoes are to DIE for. We eventually said Auf Wiedersehen and rolled ourselves out the door. That amount of food and beer made it really difficult to continue on the booze train through the city. Lucky for us, we were walking straight past our final destination…. Not in the bad scary movie kind of way. Bowling = boring right? Wrong. 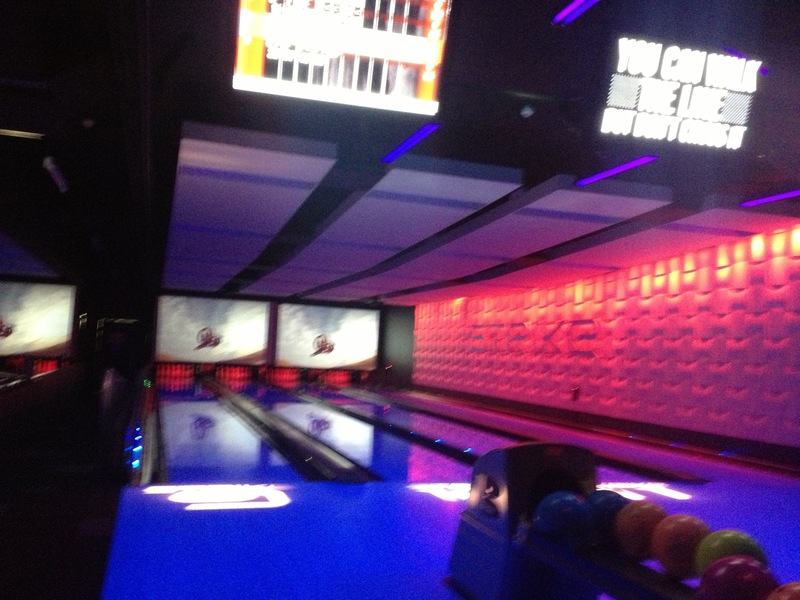 This places blesses you with bowling, lasertag, karaoke and a bar all in the one hit. Plus, for the serious ones out there, they hold your belongings so you can play to your maximum abilities. $25 for bowling + lasertag and we were in. The bowling showdown went a little like this… Auds – first go – strike. Ryan’s face, priceless. Ryan – first go – strike. And so the battle started. The result, Auds got more strikes than Ryan. Auds beat Ryan. Our friend Shane beat us both, despite less strikes. I guess we’re only doing OK if we get all our pins in one hit. I still claim a little victory, being better than Ryan and all. The highlight of the night was laser tag. Because the group we were with had been waiting a long time, we were all offered two games instead of one. Game on. I felt like a cat chasing a laser pointer everytime I saw those blue lights running through the obstacles. Turns out the other team had done this before. I spent more time out of play than not. Game two saw the battle of the sexes. Males vs females. It became even more competitive, which led to the “no running” rule being violated many times. A massive collision between Ryan and I saw a truce for about 3 seconds, a quick kiss, and then I shot him before running away. All laughs and giggles. We sweated out any alcohol consumed, and were ready to go home and go to bed. That was Friday night, which meant I spent the next three days asking Ryan if we could go play laser tag. One day he will say yes again….